One-click to send many documents to get signed or approved electronically. Bulk Send powerfully combines Legalesign contract management, live-tracking, and electronic signature, into the ultimate heavy-lifting tool to send, and have signed or approved, a large number of contracts. With one click, Legalesign Bulk Send can send hundreds of contracts and documents to many people within minutes. Plus, the e-signature software means your signatories or approvers can just as easily sign and return your documents, requiring access only to an email and internet connection. For you, the automated reminders, live updates and notifications, means you can easily monitor and watch as your documents are signed and returned. Incorporating CSV or Excel files, form fields and mail merge features, you can send thousands of semi-custom contracts to different signers in a fraction of the time it would otherwise take using email or post. Better yet with Legalesign export features you can automatically have your contracts transferred into your own cloud storage immediately after e-signature. Simple, pay-as-you-go pricing means you only pay for what you use. Prices start at £1 per document, with discounts for high volume use and in tandem with ongoing subscriptions. The source document for Bulk Send is a PDF file that is uploaded to the Legalesign web application. 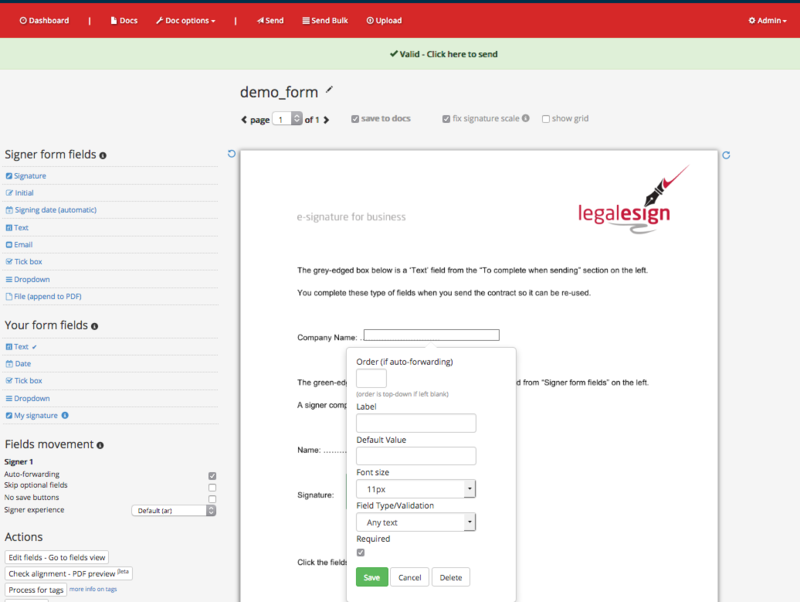 The Legalesign PDF editor provides tools to prepare the document before it is sent; to define where signers should sign, to add the mail-merge fields that will customise the document, and to add any form fields for signers to complete. The PDF editor includes options for close control over how signers proceed through their form, with extensive form filling facilities such as dropdown boxes, checkboxes, date fields, and visual control such as text size and border appearance. Legalesign can assist with document set-up upon demand. Typically, customers need to tailor a document for each signer as it is sent, perhaps with a relevant name and address, or pricing, for example. These type of fields are equivalent to ‘mail-merge’ fields and those fields simply require an individual label. These labels will be used later in the CSV file to identify the text for each mail merge field in each document. The field can be left blank, or some default text can be added as a fall-back, in case no value is given in the CSV data. When the PDF template is ready-to-go, then it is time to prepare a CSV file of signatories. 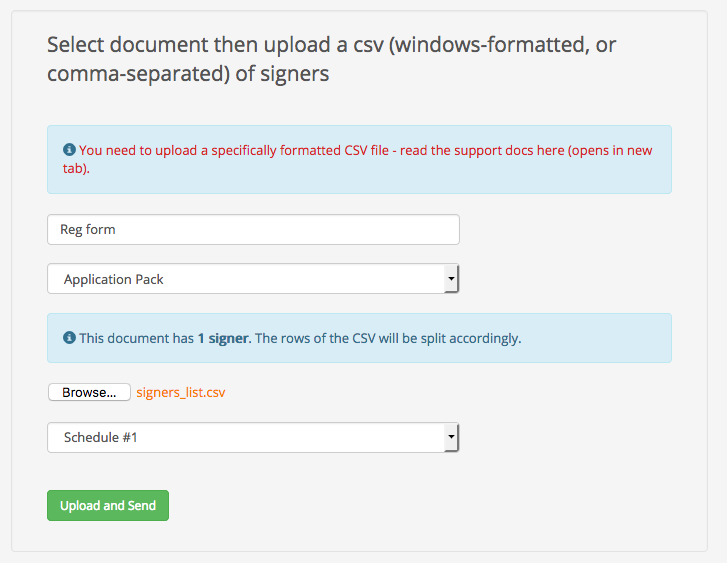 Legalesign includes a facility to get a ready-made CSV for your PDF template. Along the first row are several mandatory headings, such as the signer name and email. The aforementioned mail merge labels (if used) are written across the columns in the first row too. Bulk Send will read the first row to discover which columns contain signer information and which columns relate to the mail-merge fields in your PDF template. The CSV file should contain a list of all your signers and the values for the contract's mail merge fields. If you have more than one signer then the list will be split accordingly: row one is filled with the mail merge labels and therefore row two and three will represent signer 1 and 2 for the first document, while row four and five will become signer 1 and 2 for a second document, etc. The system will first process the CSV file and if any errors are detected these will be flagged. For example, if you have selected a two signer document but only listed an odd number of signers. The CSV error reporter gives information about the discrepancy so you can fix your CSV data. Upon success you are directed back to the main Legalesign Dashboard where you will see your new set of signers begin to appear. 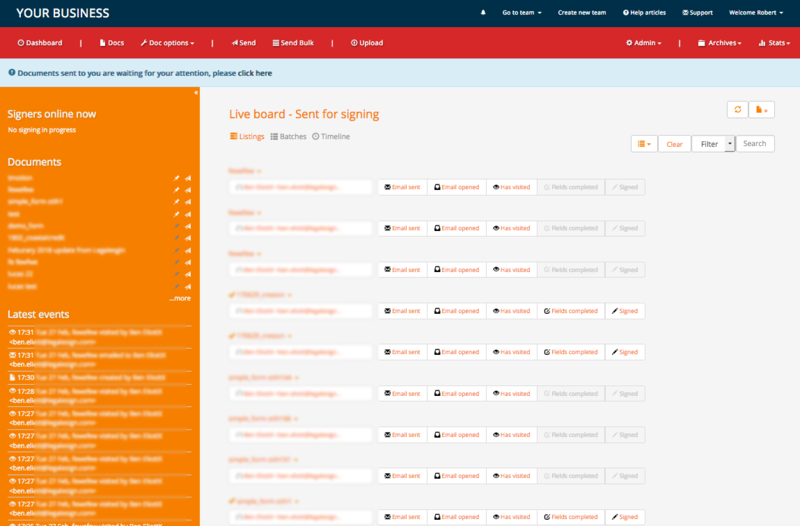 As your bulk send is sent out you will gradually see the signer states being updated on the Dashboard. Any bounced emails will be reported to you by email (if selected) but will otherwise be clearly visible in the Dashboard. The Dashboard is a real-time listing of your sent documents and contains filters and sorting for signers, documents, activity, email bounces, and more. Because of the potentially high volume of Bulk Send signers, the real-time system is not used for email sending, and so you will need to manually refresh the Dashboard to see those emails going out. However the real-time system for document tracking will work in all other respects. The Legalesign Dashboard provides extensive tools for signer management. The real-time system will alert you to the latest activities from signers. You can amend email addresses, or document fields as required, or remove documents. Filters and sorting tools enable you to search through signers, either using document names, or signer names. If you have thousands of documents being signed you will need a way to export those document to your own system. The most common way to do that is to copy them to an email inbox, which is provided by default. If you would like to integrate with a Sharepoint folder, Dropbox, or another service for document storage then contact us. In case you only want the audit log, rather than the whole signed document, Legalesign also provides facilities to export those individually. Where you have signer form fields that you want to extract the data from, for example a registration form, there is also an excel export facility available on the Dashboard so you can get all your field data exported in a few seconds. Finally, an API is also available for custom programming. You only pay what you use with Bulk Send. A business plan is required to use the Legalesign web application, then Bulk Send pricing works with an easy pay-as-you-go model. Pricing begins at £1/sent document. If you expect to send a high volume ask your account manager about volume discounts. Also, if your contracts relate to GDPR get our special 30% GDRP discount that is available before 25th May 2018. If you do not have an existing Legalesign account, get started with the free trial on Legalesign by clicking here. If you do have an existing account contact your account manager or support to turn on the Bulk Send facility. For more information about how to use Bulk Send go to our support page on bulk send here. Contact support if you have any other queries, or for assistance with your Bulk Send project. *prices exclude VAT which is applicable for customers in EU countries. I would recommend that anyone looking for an document signing solution to have a good look at Legalesign. The system is very reliable and has great functionality + via their API you can achieve excellent levels of integration with existing software. However, the best part is without doubt their customer service. A lot of online providers shout about their support, these people actually exceed what you expect. I hope this review does not sound too over the top, but try them, you will see what I mean. I needed an esign product that would be easy and simple to use, only a few documents but going out regularly, individually and in batches. Legalesign is absolutely great. The tracking is ideal as I can instantly spot all those people who haven't actioned )(or those that say they have and they really haven't). Sending documents takes seconds, and the batch process is really fabulous, today sending 60 contracts out took me less than 30 seconds - it makes a big difference. Support is great too, and always on hand. Would thoroughly recommend. Legalesign has an easy to use interface. You can customize a lot of the features, email design, copy, etc. It looks really professional when you take advantage of all they have to offer. The customer service is fantastic. Any question I have, the team is on instantly. We switched over from Docusign after having our account executive change multiple times and to try and save money. We have been very happy we made the jump! A. Patzius. Influence & Co.
E-Signing can get your documents signed blazingly fast. At Legalesign eSignature 50% of documents are signed within the hour. With eSignature you can sign from anywhere, it's more secure than paper signatures and you'll never need to overpay for ink again. Legalesign's REST API for electronic signature is as popular as the web app, and is an easy and accessible way to bring esignature functionality into a CRM or company software.